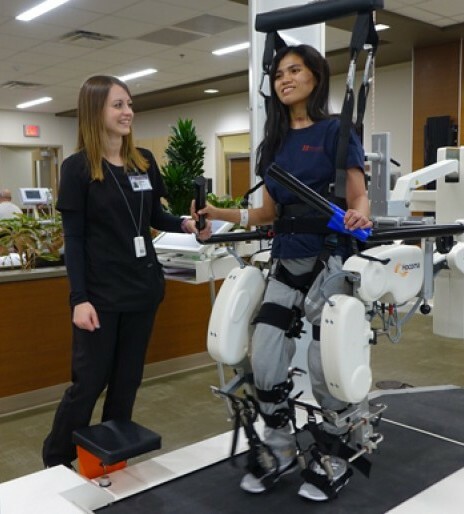 "When I first met Hniang, the left side of her body was partially paralyzed from her injury," said Sara Munzesheimer, an occupational therapist at Madonna Rehabilitation Hospitals' Omaha Campus. “We were trying to rehab her arm as much as we could,” said Sara. "We have what’s called the Armeo Spring and it’s a gravity eliminating arm support. It’s like a robot that supports the arm. There’s a bunch of sensors in it and there’s a screen in front of her and she can use that feedback from the screen using her arm as almost the controller of the video game to reach for balloons or aim or work on that coordination of reaching grasping or releasing,” said Sara. Technology disguised as a video game helps Hniang Cia regain use of her left hand. FES bike is function electrical stimulation is great for repetition because it’s like going to the gym like you’ve got to get your reps in. They say it takes it takes thousands and thousands of repetitions and movement to really regain the muscle after it’s been affected by a neurological injury and so we’re getting those repetitions in over and over again. A car crash caused Hniang’s injuries, leaving her with a severe brain injury. Every step brings Hniang closer to her goal of taking care of her family. “Madonna is a good place to go especially for brain injury. Just like myself. They love God and they work really hard. I believe that everyone who comes here will benefit from it,” said Hniang Cia, a brain injury survivor. Learn more about Madonna's brain injury program and the specialized technology patients use during their recovery.